ALBION – This tree fell on a trailer on Bayberry Lane at Oak Orchard Estates in Albion at about 7:45 p.m. 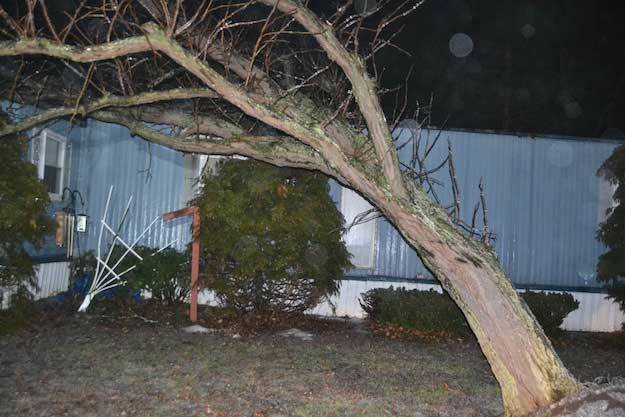 The tree didn’t appear to cause much damage to the home of Tim and Linda Good. Mr. Good said there wasn’t any damage inside the trailer. He said he expects they will stay there tonight with the tree being removed on Thursday. Good went outside to see a tree had fallen. “I was hoping it wouldn’t be this,” he said. Harry Papponetti, Albion’s fire chief, said no other trees fell in Albion, although lots of branches and wires came down. Papponetti said he is concerned about more trees falling overnight due to the soft soil and ice-coated branches. There were several trees that fell around Orleans County today including some that blocked roads in Clarendon on Orleans-Monroe Countyline Road and in Murray on the same road, as well as Horan Road in Medina.